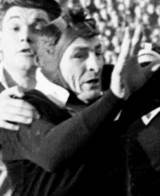 A brilliant lock, White played 23 consecutive Tests for New Zealand between 1949 and 1956, when he was part of the side that recorded a first series win over South Africa in ferocious circumstances - scoring tries in the first and third Tests. White played a further 32 tour games for the All Blacks, after initially impressing selectors while on army duty, and was a committed servant of Poverty Bay domestically. Later in life he contributed to Poverty Bay in administrative roles and also served two terms as the mayor of Gisborne. Noted rugby scribe Terry McLean wrote of White: "He played with matchless vigour, especially in the lineout." He died in 2012 after a short illness.